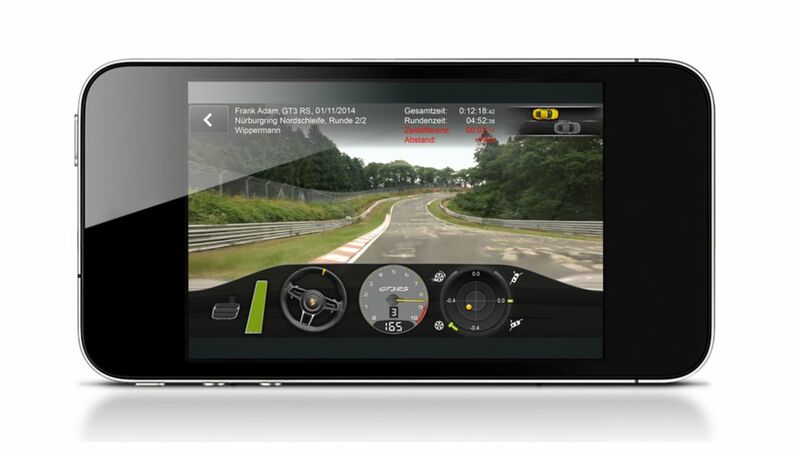 The app allows lap times to be measured via GPS and a host of driving data to be recorded and managed on a smartphone. This data can then also be shared with other drivers. The Porsche Track Precision app is part of a special Sport Chrono Package, which is only available as an exclusive option for the Porsche GT sports cars Cayman GT4, 911 GT3 and 911 GT3 RS. It also includes the pre-fitting for connecting a lap trigger, which is available as an option from Porsche Tequipment. This lap trigger allows lap times to be measured even more precisely than using the GPS signal. You can download the free smartphone app for Android or iPhone from iTunes or Google Play. It allows the driver to perform a detailed and objective analysis of their lap times and driving style using synchronised data and video recordings. To do so, it utilises precise vehicle data from an auxiliary control unit in the vehicle as well as the smartphone’s high-resolution camera and GPS signals. The Porsche Track Precision app offers a unique range of functions, both while driving as well as for subsequent analysis. Before setting off, the driver simply has to select the desired track. This can be done either before or during the approach to the track. There are already about 60 international racetracks available in digitised form so far. Additional tracks can be conveniently added in a map editor beforehand or can be created when you drive the first lap in the car. To ensure high video quality, the driver should then affix the smartphone in a secure mount on the windscreen. As soon as he passes the start line, the system automatically begins to record using the GPS data. The data can be saved with the tap of a finger after passing the finishing line when the car leaves the track. On the track, dynamic performance is also visualised in the form of traction, steering response, and longitudinal and lateral acceleration. In addition to the sector and lap times, the display also shows precise position of deviations compared to a reference lap, which can either be driven previously or preselected. The driver can also always see the differences in time, distance and speed at a glance on an animated “ghost car”, with two vehicles used to indicate the current difference in comparison to the reference lap on the display: the car in front is faster. Because all of the data and the video recording are saved in the smartphone, it is possible to produce a video analysis immediately after the vehicle is stopped, allowing you to improve your performance in the very next lap. A unique feature is the display in the specific, animated 911 GT3 or Cayman GT4 cockpit with a steering wheel that is synchronised with the video and simulated accelerator and brake pedals. Almost all of the driving data are displayed, such as engine speed, gear position, speed, steering angle, accelerator and brake pedal position, lateral and longitudinal acceleration (G-force) as well as traction and oversteer or understeer. 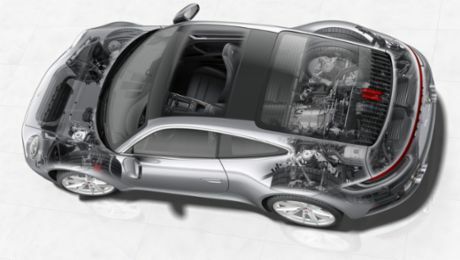 Porsche has developed a special control unit for data collection and transmission, which acquires all of the relevant information from the on-board network ten times per second and encodes it with a high-precision time stamp. This ensures that no inaccuracies arise during transmission to the smartphone via WiFi. The driver can use the smartphone menu to select whether to use the GPS signals from his mobile phone, the car, or from an external, high-precision GPS receiver. GT customers who did not order the Sport Chrono Package when buying a new current-generation Cayman GT4, 911 GT3 RS or 911 GT3 can have the Track Precision app retrofitted by Porsche Tequipment at a Porsche Centre.